We introduced you to Brynje earlier today, and we want to share with you another piece of clothing from this fantastic company; this time from their Wool Thermo Light Collection, the Lady Wool Sports Top. 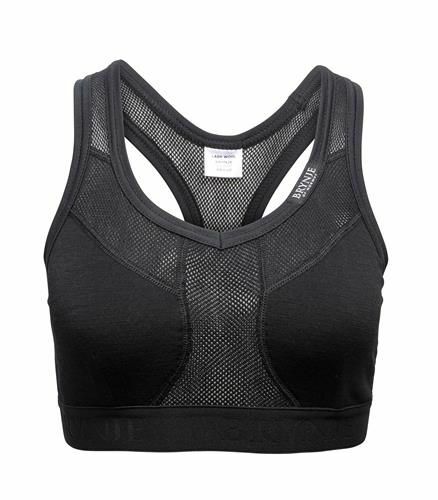 This sports bra is designed out of a wool blend – don’t worry about overheating though because it’s a lightweight blend that is breathable and has moisture wicking properties. Also the back, straps, and inserts down the middle and above the cups are fashioned out of a fine mesh that will provide you with plenty of air flow in strategic areas. The three-layer cup design has a wider mesh lining and solid knit fabric on the outside for modesty as well as the same insulating and wicking properties as the Arctic Longs. We found that it provided good support for medium impact activities and was very comfortable for all day use without any restrictions to movement. The Lady Wool Sports Top is another winner from our friends at Brynje!